▲1. Appearance: Get rid of the heavy and huge shape of the old audio system. AKM bluetooth audio is more concise and generous in appearance. A slim, sleek speaker perfectly combines with your ultra-thin TV. ▲2. 3D Stereo Sound: Double bass speaker, 360°stereo surround sound, make the voice more real, whether it is game or movie, let you immerse. ▲3. Hands-Free Function: Built in high-definition microphone, can answer the phone or hang up. ▲4. Anti-skid Function: The bottom of the speaker is equipped with rubber pad, anti-skid, shock absorption, reduce noise. ▲5. Super standby time: charging for 4-5 hours, can be used for more than 12 hours. 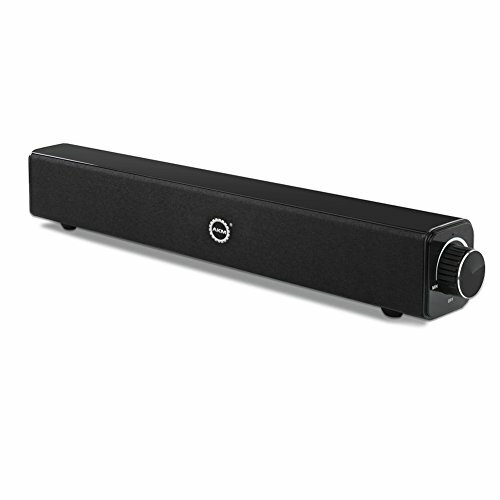 AKM sound bar stop working for 10 minutes will enter sleep mode to save power. If you need it to work again, please turn off sound bar and restart. If you have any problems during the use, please contact us in time. AKM customer service team will answer questions for you within 24 hours. DOUBLE SPEAKER INSTALLATIONS: 3D stereo sound,wireless subwoofer. The sound is a high fidelity sound system which is diamagnetic and noise resistant. 360 ° stereo surround sound, make you at home to enjoy the sound quality of the movie theater. WIRED and WIRELESS: Get rid of the size and complexity of older audio systems. AKM sound bar can be used only if one line is simply connected. Wireless bluetooth has a range of up to 33 feet /10 m.
SCREEN PARTNER: You can connect sound bar to your computer to bring you a super real game experience.It can also be paired with TV to create an elegant home theater atmosphere for you. HUGE BATTERY CAPACITY: The bluetooth audio has a built in 4500 mA strong lithium battery, charging for 4-5 hours, lasting 12 hours! Support USB charging, can use computer and power bank charging, faster and more convenient. CONTROL with BUTTONS or REMOTE: Operates via the in-unit buttons or included cellphone; LED shines in different colors matching the functions.Blue represents work, red represents charging. Wireless equipment, suitable for travel, party, easy to carry.